What does a frogman do when he encounters and enemy frogman underwater? Well, he can attempt a watery, zero gravity-like knife fight to the death, or her can pull his Heckler & Koch P11 underwater pistol! You have to love the weapon designers over at Germany's Heckler & Koch, they really keep the special forces operator in mind, and of these unique super-soldiers none operate in a more inhospitable environment than combat divers. 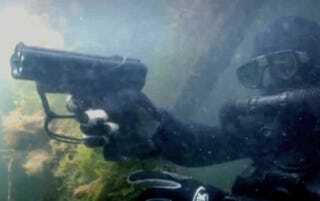 The P11 Underwater Pistol, originally designed in the 1970's and who's existence HK has denied for many decades, is really a pistol sized rocket launcher for the discriminating frogman. It fires up to five fin stabilized, rocket propelled darts, that are self contained inside individual barrels. These barrels are clustered together in a pentagon pattern in the gun's block-like upper receiver. The darts measure 7.62mm X 100mm and are effective underwater to about 50 feet near the surface, with decaying range the deeper you descend into the abyss. Above water, the P11 has a range of about 100 feet, although accuracy is far from great at that range. What is so interesting about the P11 is that it is not operator reloadable. In order to do so the pistol's upper receiver has to be sent back to HK to be repacked with the aforementioned solid fuel rocket-darts in their self contained barrels. These barrels are then sealed at the business end by a plastic membrane that ruptures upon detonation of the cartridge inside. These cartridges are actually activated via an electrical charge supplied by a nine volt battery pack located in firearm's over-sized grip. The weapon is pretty bulky for a pistol, but considering that divers are already wearing bulky diving suits, mask and gloves, as well as oxygen tanks or rebreathers, it actually looks quite at home in a fully equipped combat diver's hands. The P11, a gun that Aquaman's mortal sidekick would pack, is said to have been continuously upgraded over the years and has served with special operations forces units around the globe, including a good majority of NATO partners, the US Navy SEALs and Israel's top combat diver teams. Although the P11 is clearly innovative, the west is hardly alone when it comes to underwater dart slinging capabilities. The Russians actually fielded a similar, and arguably more usable weapon, years before the P11 was introduced, and some say the P11 was a response to it. The SPP-1 is actually quite similar to the P11 in that it has a cluster of barrels (four instead of five) that fire darts. Yet the SPP-1 is a simpler, less bulky, more archaic looking design. It does not rely on a battery to ignite its ammunition and it can be reloaded by tilting the barrels group forward like a break open shotgun (breach-loader) and reloading can be accomplished both under or above the waterline with relative ease. The SPP-1 is still in use today, almost fifty years after its birth, yet the Russian did not stop at fielding "just" an underwater pistol. Around the same time that the SPP-1 became fully operational (1971), the Soviets, who were paranoid about American frogman assaults, begun to pursue an underwater automatic rifle called the APS, or "Special Underwater Assault Rifle." The APS was AK-47 sized and similar in format, and sported a massive banana style magazine that contained some 26 self-contained rocket like 5.66mm X 120mm darts cartridges. The APS was fully automatic and could unleash its full dart barrage in a matter of seconds, which is quite an accomplishment considering how much different a medium water is compared to the more forgiving above-water atmosphere. The rifle's upper receiver in particular had to feature unique design elements that accommodated the water's much higher resistance compared to air. The APS served with Soviet and Russian forces for decades and is only now in the process of being fully replaced by a shadowy new Russian underwater rifle. The APS-DM, a late 1990's evolution of the APS, was really the first subsurface/above-surface rifle ever put into production. In other words, it could fire ammunition optimized for both underwater warfare and ground warfare with reasonable reliability. The APS-DM used a shallowly rifled barrel attached to a unique elongated receiver that hat two magazine wells, one that could accommodate a 26 round, 5.4mm dart filled APS style magazine and one for a standard 5.45X39 cartridge filled banana style magazine. In other words, this amphibious rifle of sorts could sling darts at the enemy below the water, and with some fairly simple adjustments, it could fire a standard Russian military rifle cartridge above the water. Yes, this rifle was a little ungainly, but supposedly it worked decently, and it finally allowed Russian combat divers to go into battle with a single weapon for amphibious operations. In the past, Russian frogmen would have to carry the APS and an AK-74 on missions, which was far from ideal to say the least. After the APS-DM's proved that one weapon could be used in two totally different atmospheric environments, Russia has continued its pursuit of the ultimate "dual medium" assault rifle in the form of the bullpup format ADS "amphibious assault rifle." The ADS designers took a slightly different approach than its predecessor, mainly this came in the form of an innovative ammunition design. The ADS utilizes a 5.45x39 standard cartridge as well as an underwater cartridge designed with almost the exact same dimensions. This means that both types of ammo fit into a standard magazine and thus the rifle features a single magazine well. As a result, it the ADS is reasonably compact in size and has a far simpler manual of arms when compared to the much more complex APS-DM. This innovative new weapon, fielded officially last year, is said to be quite effective and reliable, and can be fitted with silencers, grenade launchers and all the other goodies found on a standard above water frogman's assault rifle. There is even talk that it will fully replace both the APS and AK-74 that have been carried simultaneously by Russia's elite combat diver corps. So there you have it, a brief history of modern underwater firearms carried by frogmen around the world. It is interesting that Russia has made the fielding of heavy underwater weaponry much more of a priority than their western counterparts. Maybe this is a decision motivated by a defensive amphibious mindset, where the Russians may have been more focused on rebuffing a possible underwater attack than on offensive operations, which have the elements of surprise and timing on their side. On the other hand, maybe the west did not see Russian combat divers as much of a threat regardless of how powerful their dart slinging underwater assault rifles were. Whatever the reasoning was behind the west vs east underwater arms capability gap, I sure would not want to go for a swim near any Russian nuclear submarines or key maritime facilities knowing that Russian combat swimmers armed with fully automatic dart guns may be hiding below the waves! On a side note, it is too bad that the popular James Bond flick "Thunderball" was not made after the advent of the HK P11, or the Russian ADS for that matter, as their presence may have resulted in an even more spectacular underwater battle scene than the one that the spear guns toting "SPECTRE" henchmen provided! Photo credits: P11 shots via HKpro.com, ADS via wikipedia/REMOV, Thunderball diver squad via Bond Wiki, the remaining shots via Russian industry/military and youtube.